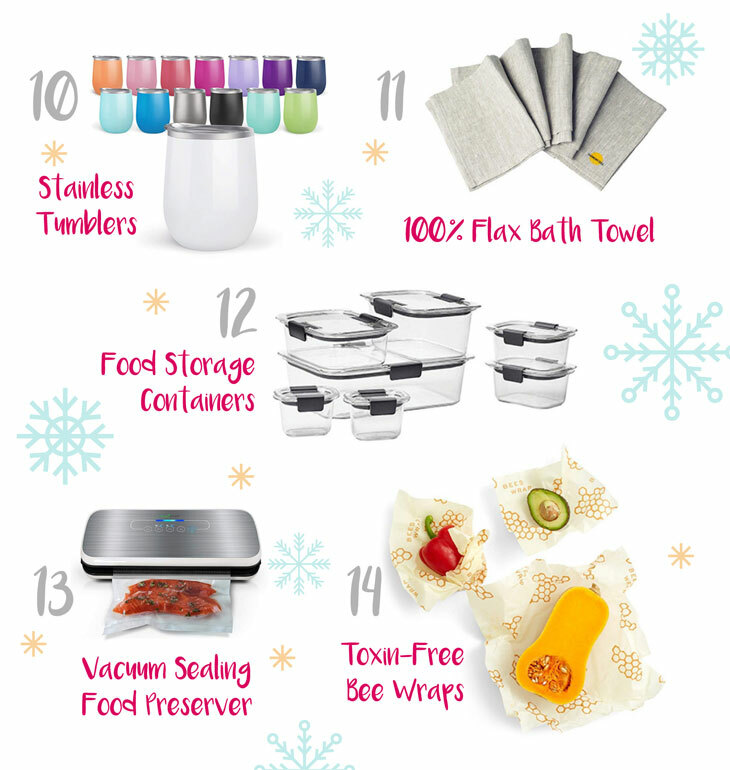 14 awesome things that you need to add to your keto Christmas wish list, plus discount codes exclusive to Healthful Pursuit readers. 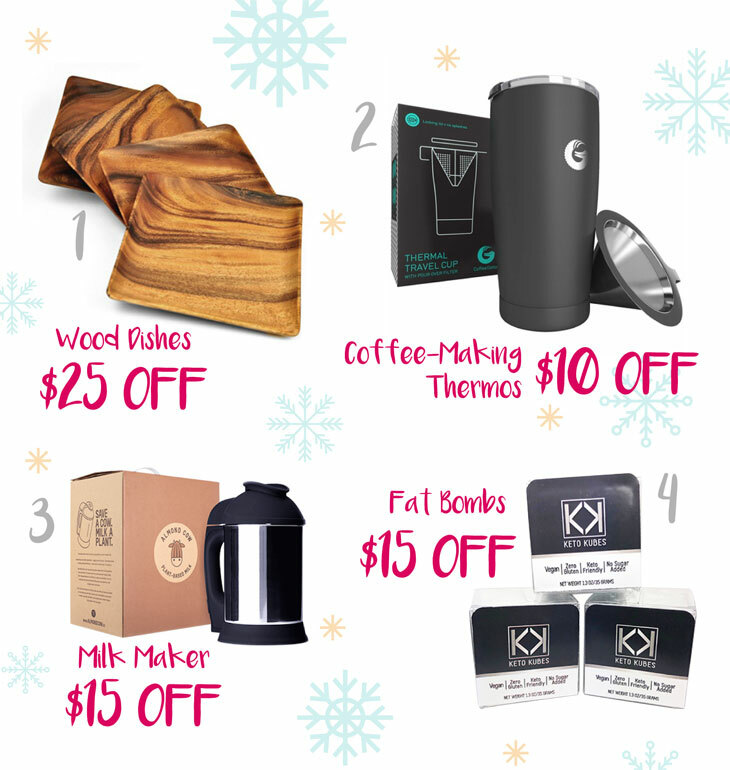 ‘Tis the season for savings! Not sure what to get your keto friends and family this holiday season? Building your dream keto Christmas list and you need a bit of inspiration? 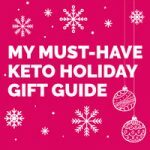 I’ve got a bunch of amazing keto options for gift giving: a whole list (checked twice!) with the coolest kitchen gadgets, self-care must haves, keto treats, and beyond. All loved, obsessed over, and approved by me! Items start at $9.99, with exclusive coupon codes, so you can get the goods and save. 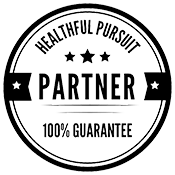 Just click the links below to get the savings and start shoppin’ (or if you’re dreaming that someone special in your life will do the keto shopping for you, share on Pinterest!). Because those stockings aren’t going to stuff themselves, right? 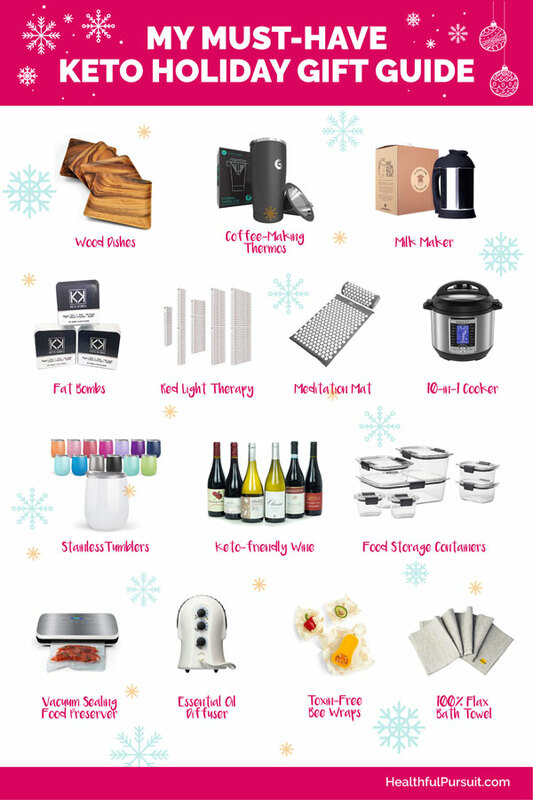 Let’s get to it — scroll down for keto gift inspiration! Toxin-free Acacia Wood Dishes, the best family gift. So many dish options come with toxins that leach into food over time. After doing a bunch of research, I knew I needed to swap out my dishes, and this is what I landed on. Get the $25 off discount code! Coffee-Making Thermos, the best colleague gift. I use this thermos to make my fatty coffees on the go and it works like a charm every time. Get the 10% off discount code! Dairy-free Milk Maker, awesome for your kitchen. I can’t live without this dairy-free milk maker. From cashew milks, to coconut milk, and just about everything in between. You think a nut milk bag does the trick, until you have one of these! Get the $15 off discount code! Fat Bombs, the perfect stocking stuffer. Cashew butter surrounded with raw cacao nibs and melted chocolate. Are you drooling, too? Get the 15% off coupon code. Red Light Therapy, to maximize your self care routine. An awesome way to heal scar tissue, have a little selfcare time, and it’ll fit anywhere in your house. Meditation Mat, for balanced self care. A little self care goes a long way, and this mat that folds into a cute little carrying case; awesome for travel, can give you that 5-minute break you need to feel refreshed and relaxed. 10-in-1 Cooker, for the cook in your family. 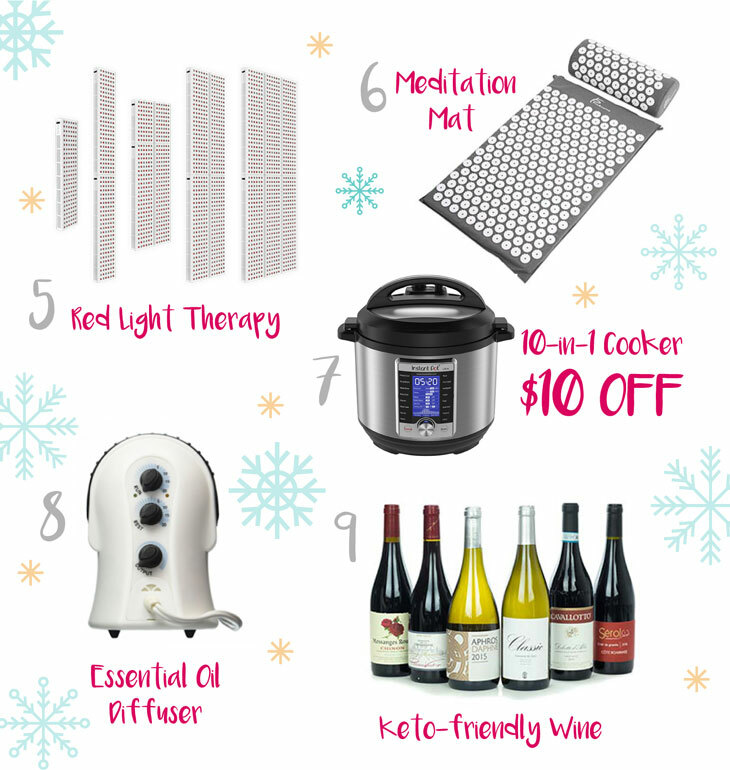 My favorite ways to use a pressure cooker, awesome accessories, and get the $10 off discount code! Essential Oil Diffuser, for the parents. This bad boy doesn’t require water so there’s no stopping and starting, spillage, and diluted oil smell. It uses far less essential oil and the scent created is so powerful! Keto-friendly Wine, for the best friends. There’s a lot to wine, and a lot of things you don’t want in it. From sugars, flour, colorings, it’s a hot mess. Read more about how to find a healthful wine AND get a penny bottle of wine here! Need more awesome ideas? I’ve got a sleigh full! Stainless Tumblers, these tumblers come in a rainbow of colors and a BPA-free lid. The tumblers are double walled with stainless steel, so they keep your drink cold (or hot) for hours. I love these for entertaining, everyone knows which cup is theirs. 100% Flax Bath Towel, the best towels I’ve ever bought. We’ve had them for 6 months, and they still look and feel like new. These towels dry really fast AND they help to exfoliate your skin. The best part? No chemicals! Food Storage Containers: Best. Food storage. Ever. I’m so pleased with these, they stack so well and they’re great for homemade granola. I use them for dry goods — glass containers are better for anything heated. Vacuum Sealing Food Preserver, fabulous for preparing meals raw and freezing for later, or for stocking up on bulk orders of meat. Bonus: you can reuse the bags! Toxin-Free Bee Wraps, reusable, toxin-free, biodegradable cotton cloths coated in beeswax for food storage! All you have to do is create a little warmth with your hands where you want to create a seal and you’ve got a healthy alternative to plastic wrap. The best part? These wraps come in the cutest patterns! Looking for more of my favorite things to fill your wish list? Click here! I hope in the midst of gift giving and enjoying your favorite keto treats, you get a moment to pause and celebrate the spirit of the season. I’m so thankful to have such an amazing community of wonderful keto people — thank you for being part of the Healthful Pursuit family, and Happy Holidays to you and yours!